We’d love your help. Let us know what’s wrong with this preview of The Cobra Event by Richard Preston. The Cobra Event is a petrifying, fictional account of a very real threat: biological terrorism. Seventeen-year-old Kate Moran wakes one morning to the beginnings of a head cold but shrugs it off and goes to school anyway. By her midmorning art class, Kate's runny nose gives way to violent seizures and a hideous scene of self-cannibalization. She dies soon after. When a homeless man meets a similarly gruesome  and mystifying  fate, the Centers for Disease Control in Atlanta sends pathologist Alice Austen to investigate. What she uncovers is the work of a killer, a man who calls himself Archimedes and is intent on spreading his deadly Cobra virus throughout New York City. A silent crisis erupts, with Austen and a secret FBI forensic team rushing to expose the terrorist. Even more frightening than Preston's story about the fictitious Cobra virus, however, is the truth that lies beneath it. As the author writes in his introduction, "The nonfiction roots of this book run deep.... My sources include eyewitnesses who have seen a variety of biological-weapons installations in different countries, and people who have developed and tested strategic bioweapons." In fact, the only reason The Cobra Event was not written as nonfiction is that none of Preston's sources would go on record. Woven throughout the novel are sections of straight nonfiction reporting that reveal the terrifying truth about the development of biological weapons and the clandestine operations of Russia and Iraq. Three years of research and more than 100 interviewswithhigh-level sources in the FBI, the U.S. military, and the scientific community went into The Cobra Event. The result is sure to shock you. To ask other readers questions about The Cobra Event, please sign up. I want to buy or download this book at minimum cost .How to get it? This is an excellent and VERY scary bio-terrorism thriller. I have read many of Richard Preston's books that relate to potential biological hazards and he never fails to bring the suspense. In fact, this book has one of the top 5 most suspenseful scenes I have EVER read in a book. I cannot talk about it too much further (spoilers, you know . . .), but lets just say a character has to make a split second decision that will have you hanging on the edge of your seat! If you are a thriller fan, you o This is an excellent and VERY scary bio-terrorism thriller. I have read many of Richard Preston's books that relate to potential biological hazards and he never fails to bring the suspense. In fact, this book has one of the top 5 most suspenseful scenes I have EVER read in a book. I cannot talk about it too much further (spoilers, you know . . .), but lets just say a character has to make a split second decision that will have you hanging on the edge of your seat! If you are a thriller fan, you owe it to yourself to read this book! Sometimes you just crave a classic thriller -- and there is a reason that Richard Preston's THE COBRA EVENT is a classic. A tale of a biological warfare attack on Manhattan, it's the sort of impeccably researched scare-fest that really does keep even a jaded novelist like me reading well past my bedtime. This book was amazing! Richard Preston, the author of "The Hot Zone," (the true story of the Ebola outbreak of a monkey research facility in Virginia) knows his stuff! This man is brilliant! Honestly, I can't say it enough. He knows diseases, virology, epidemiology, criminology and suspense. He KNOWS his stuff. Seriously if you haven't read any of his books, shame on you, get to it! NOW! I thoroughly disliked this book. It started by introducing a little girl and savagely killing her with a horrible nervous system destroying virus. Unfortunately I was eating lunch when I started the book and lost my appetite (which has never actually happened to me). I'm 200 pages into the book and the characters, setting, and descriptions are weak. It's like Preston followed a simple book writing formula, first introduce character, then describe character, describe setting, add something unique I thoroughly disliked this book. I'm 200 pages into the book and the characters, setting, and descriptions are weak. It's like Preston followed a simple book writing formula, first introduce character, then describe character, describe setting, add something unique or personal... It felt formulaic to me. Next up, the pages and pages and pages of Russian, US, and Iraq Bio weapon histories. I'm half way through the book and almost nothing has happened because Preston has spent too much time giving a history lesson and raving about everyone's lack of security. At one point he actually breaks the 4th wall to tell me this all true. I have always had a unexplained love of stories about epidemics and threats of apocalyptic level disease outbreaks. I like disaster movies in general, but in particular ones featuring disease, whether natural or a bio weapon. There aren't too many terrific novels in this genre, since many tend to be the same. It's exciting up until the point where the virus outbreak occurs, and then it sort of sinks into typical survivalist post-apoc fare. This one, however, is very likely the best NOVEL written I have always had a unexplained love of stories about epidemics and threats of apocalyptic level disease outbreaks. I like disaster movies in general, but in particular ones featuring disease, whether natural or a bio weapon. There aren't too many terrific novels in this genre, since many tend to be the same. It's exciting up until the point where the virus outbreak occurs, and then it sort of sinks into typical survivalist post-apoc fare. This one, however, is very likely the best NOVEL written ever about a viral outbreak. The author, Richard Preston, really knows his stuff. He is the author of "The Hot Zone", the best known work of non-fiction about dangerous viruses like ebola, marsburg, etc. Specifically, "The Hot Zone" focuses on the threat of zoonosis, or viruses contracted from animals, especially with the leveling of the rainforest (which exposes new species and their bugs), modern transportation, etc. "The Cobra Event" focuses on a different kind of threat--bio engineered and weaponized viruses. It's a fictional thriller that features an engineered virus that someone is threatening to loose in New York City. It's a horrible virus that's been engineered from a moth virus and the common cold to create a "brain pox". The symptoms are extremely gruesome and the bug is 100% lethal. In the story, a few mysterious deaths show up in NYC and a CDC doctor is sent to investigate. She (Austin) realizes it's a very dangerous new bug and calls in the big guns. The book is mostly procedural/investigative. The CDC and FBI get involved trying to decode the virus and then catch the guy who has it before he lets it go in a huge dose and kills most of mankind. There are also good elements of medical thriller in the book, with vivid description of the cases and autopsies. There's a great deal of real history of biological weapons mixed in, sometimes tangents that go on for pages (such as about the weapons inspections in Iraq). Some readers just looking for a seamless thriller might get annoyed at these info dumps, but I found it all really interesting, and the real life stories added to the sense of reality that made the book more all the more frightening. Fortunately, the book never does devolve into survivalist/post-apoc tedium since the worst is avoided. As such it reads more like an action/investigation thriller, which I liked. While I would have given this book a five star rating, some parts were jumping back and worth a little too much. With that being said, this book is terrifying. The author did a lot of research on it, but he also fictionalized some parts (mainly names and instructions on how to build weapons - for obvious reasons). The core part is that, yes, these things can and do happen all the time. We don't hear about it always but these types of biological weapons are aimed at eliminating a vast number of a While I would have given this book a five star rating, some parts were jumping back and worth a little too much. With that being said, this book is terrifying. The author did a lot of research on it, but he also fictionalized some parts (mainly names and instructions on how to build weapons - for obvious reasons). The core part is that, yes, these things can and do happen all the time. We don't hear about it always but these types of biological weapons are aimed at eliminating a vast number of a population, not to kill everyone. There will always be some people who are "immune" to it. The book itself kept going back from one person to another. It kept jumping from the unknowing victims and their final days to doctors to army personal and how they want to deal with the threat. Speaking of doctors, there was a bunch of scenes that dealt with autopsy of the victims. Some are very graphic, like the one where they peel the skin off the skull or the one where they basically yank out all the reproductive organs of a woman through a certain place on her body. Not for the squeamish. Another thing that is scary is that a lot of countries have the power to grow these viruses. In fact, Russia at one point grew so much that one batch could have almost eliminated entire countries. These are also very specific viruses that are grown and engineered in labs that could be hiding anywhere. They have constant funds from private investors and can be disguised as regular medical research labs. Well, I’ve just described how the Cobra virus works. The Cobra Event is a realistic science fiction. It’s about a virus, Cobra, which affects the brain and turns one into a monster, killing oneself from inside. A homeless man dies on a subway platform. Days later, a teenager dies under strange circumstances. Dr. Alice Austen of the Centers for Disease Control in Atlanta is sent to New York to examine what seems like an outbreak of a disease. Along with her fellow scientists, she discovers this disease is actually a virus, released by an unknown terrorist, with strong indications of a bigger release to come soon. What follows is a flurry of scientific activities as they battle to discover the properties of this new virus, because doing that would help identify the terrorist. This is one of those kinds of books I refer to as edutainment. I learnt much scientific stuff while reading. I was entertained by the chilling story as well. There were lots of biological and medical stuffs I liked in the book. I was distracted, though, by some of the expositions. The author seemed to explain everything, and with too many details, the reading experience felt like science lecture sometimes. I was detached a bit, but I kept on reading because I wanted to see how everything ends, though I predicted rightly who would and who wouldn’t survive. About the characters, I didn’t really connect with any of them. I felt they didn’t have much depth. The bad guy, a scientist-turned-terrorist, however, was a real bad guy. Overall, I’d say The Cobra Event is a wonderful read. I loved the chills it gave me—sometimes I stopped to wonder what if the air I were breathing was filled with virus particles. That’s what this book does to you. It shows you what a bioterrorist attack could look like today. I’d have given it more stars if the first part of the book didn’t drag out. The last fifty pages, with its fired shots and explosions, were the best parts. I recommend this book to anyone who loves a good medical thriller and who doesn’t mind lectures while reading fiction. The author has some really great nonfiction books. You’ll love this book if you’re a Michael Crichton fan. Once again Richard Preston sets out to scare us about the (very real) threat of diseases and viruses that could wipe out a significant portion of the world population. Unlike The Hot Zone: A Terrifying True Story this book is fiction and about what if a virus was altered and used as a weapon, rather than about a natural virus. The first half of this book is great. The slow buildup as the virus starts to be found, the uncertainty of the source or nature of it, the small snippets of real-life backg Once again Richard Preston sets out to scare us about the (very real) threat of diseases and viruses that could wipe out a significant portion of the world population. Unlike The Hot Zone: A Terrifying True Story this book is fiction and about what if a virus was altered and used as a weapon, rather than about a natural virus. The first half of this book is great. The slow buildup as the virus starts to be found, the uncertainty of the source or nature of it, the small snippets of real-life background of biological weapon research and development. But once the source starts to be revealed the book really loses its way and degenerates into a generic chase with an inevitable conclusion. Sorry to tell you but the good guys win in the same way they do in every Hollywood blockbuster. Now it's not that I don't want the good guys to win but it was so predictable and cliched it really let the book down. If the authors intent was to scare and educate people on what these viruses can do then he really should have taken it further. The start was great with random people dropping, terrifying symptoms, panic and uncertainty. He should have played that part out a lot longer. Let it creep out into further random parts of the city. The public knowing something but nothing at the same time. And towards the end ramp it up to full blown epidemic. The virus was defeated too easily and it could give people a false sense of security. He should have shown what could really happen if it got loose. This book I discovered by chance--and I am glad I did. It was a real page turner. Published in 1997 it is the horrifying story of "black biology" and the possibilities of biological weapons. The CDC, New York City police and fire department, and the FBI form "Reachdeep" -- a criminal investigation team working together to solve biological weapons mystery before a deadly "brainpox" virus is released worldwide. A great deal of the book is based on facts that we should all be aware of now. It is a t This book I discovered by chance--and I am glad I did. It was a real page turner. Published in 1997 it is the horrifying story of "black biology" and the possibilities of biological weapons. The CDC, New York City police and fire department, and the FBI form "Reachdeep" -- a criminal investigation team working together to solve biological weapons mystery before a deadly "brainpox" virus is released worldwide. A great deal of the book is based on facts that we should all be aware of now. It is a textbook of sorts for the layman. It even contains a glossary. Find a copy and read it. You will not be disappointed! I already knew it all from reading this excellent, WELL-RESEARCHED novel. I have looked at his more recent books--Preston writes a great deal of nonfiction. I can see why. 2.5 stars. A good story but not very good writing. He lapses into encyclopedia-like explanations, often repeating the same fact thrice in one paragraph+, his metaphors are horrible, and the point of view is all over the place. Also though he brags in an introduction about how accurate it is, there really are problems in the science, at least as I understand it. + Page 57: " [he] fitted a chain mail glove over his left hand. ...the prosector wears a metal glove on one hand … Most accidental knife 2.5 stars. A good story but not very good writing. He lapses into encyclopedia-like explanations, often repeating the same fact thrice in one paragraph+, his metaphors are horrible, and the point of view is all over the place. Also though he brags in an introduction about how accurate it is, there really are problems in the science, at least as I understand it. "The Hot Zone" scared me to death when I read it 20 years or so ago. I missed his fictionalized version of what a bio-terror event might look like in a major city. A little stilted at times (when Preston tried to inject more fiction-type elements into the book, he is really a better non-fiction writer) but overall really well-researched and terrifying. A little dated as it's almost 20 years old, but still a good read. This author kind of reminds me of Michael Crichton and Dan Brown, in that it's written like a screen play. I read this book and still got a C in my bioterrorism course. LAME. Re-read. A thrilling story that seems almost plausible by today's standards. That is what makes this story truly horrifying! Richard Preston needs to learn how to write a cohesive story. Plain and simple. Honestly got a page in and had to stop, it was so bad. I have no words. Read the book. Read it, in all of its sciency amazingness. The first book to ever scare the actual living heck out of me, but in such a good, adrenaline-filled way that I don't even care. Read the book. I don't often read the afterword in novels, but I did for some reason with this one, and in doing so had some of my problems with the book confirmed. Preston admits himself that this is a blend of fiction and non-fiction: that he'd taken a non-fiction scenario and non-fiction research and fictionalised them. I found it a very uneasy blend. It's extremely detailed about viruses, their weaponising, the equipment, the strategies to combat them... Research is used best when it's used sparingly. I wa I don't often read the afterword in novels, but I did for some reason with this one, and in doing so had some of my problems with the book confirmed. Preston admits himself that this is a blend of fiction and non-fiction: that he'd taken a non-fiction scenario and non-fiction research and fictionalised them. I found it a very uneasy blend. It's extremely detailed about viruses, their weaponising, the equipment, the strategies to combat them... Research is used best when it's used sparingly. I was watching Jordan Peterson the other day (if you don't know who he is, you should, so I'm not explaining him) and he said you should always know 90% more than you speak about. I reckon writing is the same. I got the impression with this book that I got the 100%. Having said all that, this is a fascinating insight into the possibilities of bioterrorism. The virus chosen is particularly horrific, and the description of the agonies endured by the sufferers was almost too intense to read in parts (the self autopsy scene comes to mind). The final chapters, closing in on the terrorist and the hunt through the subway tunnels, were brilliantly tense. I think this would make an incredible movie. It's hard to rate. Some of the novel is 5 stars, some I struggled with and thought appallingly written (for a fictional novel). So I'm sort of averaging it out. My thrill and excitement for this novel started to dissipate a little more than halfway through. Possibly at my own fault, not sure. There were moments in which I wasn't sure if the author desired to tell a great story or to anecdote a great textbook. The story would be moving along quite nicely and then we'd pause, take a step back away from the setting & characters, and discuss real-life biology or geography or science history. Hard to get a good cadence with these odd interruptions. I fou My thrill and excitement for this novel started to dissipate a little more than halfway through. Possibly at my own fault, not sure. Hard to get a good cadence with these odd interruptions. I found myself skipping thru them; perhaps they'd benefit another reader who cannot accept fiction as fiction. The conclusion was very claustrophobic. It puts me in the mind of a Douglas Preston novel which makes me ask if authors Douglas & Richard share more than just a last name. Take it or leave it. I've owned this book for maybe 5yrs and am just getting to it. I read the majority of this book with my shirt over my mouth and nose, the scenes in this novel were disturbing and I couldn't help it. This had more gruesome descriptions than The Hot Zone, or I was just more disturbed because the autopsies were on humans, not monkeys. Biological warfare is the weapon of the future, I think. As T.S. Eliot wrote, the world will end not with a bang but a whimper. Disease causes a whimper, not a bang. This novel follows Alice (does Preston always center on female p I read the majority of this book with my shirt over my mouth and nose, the scenes in this novel were disturbing and I couldn't help it. This had more gruesome descriptions than The Hot Zone, or I was just more disturbed because the autopsies were on humans, not monkeys. This novel follows Alice (does Preston always center on female protagonists?) as she connects the death of two strange deaths in NYC. She eventually comes to a correct conclusion and saves the world. I had already read Preston's ground-breaking non-fiction The Hot Zone: The Terrifying True Story of the Origins of the Ebola Virus. But a fiction writer he ain't. Cardboard characters, a stupidly evil villain, an incredulous plot, and worst of all, poor writing. I expected much better after having read his non-fiction. If you haven't read it, I would give it a miss. Very well-researched. A masterclass in preparation and investigative interviewing as a means of laying down a believable scenario with believable agency protocols. In this book, the reader experiences all of the crimes and crisis in the modern day as they happen, from the perspectives of both the protagonist and antagonist. The main crime and important event occurred in the beginning of the book, and causes the main character to become involved. That crime that began the book also happened to other characters throughout the middle and the end. This crime/crisis that the story focused on was a form of genetically engineered disease that was then used as a f In this book, the reader experiences all of the crimes and crisis in the modern day as they happen, from the perspectives of both the protagonist and antagonist. The main crime and important event occurred in the beginning of the book, and causes the main character to become involved. That crime that began the book also happened to other characters throughout the middle and the end. This crime/crisis that the story focused on was a form of genetically engineered disease that was then used as a form of bioterrorism throughout the novel. The book was mostly about the main characters attempting to discover the person responsible for the crime, though there is an emphasis on discovering what the virus was and how it was created. Readers follow the villain and his motives relatively early and continue throughout the book. Unfortunately, the discovery of the villain is very underwhelming, though the discovery on the end of the detectives is relatively satisfying. The characters don’t explicitly know that they are in danger until the middle of the book; by then there have been multiple victims of the disease and they had already performed an autopsy on the first victim. I think that it definitely made the book more suspenseful because the disease was extremely contagious (as contagious as the common cold), and caused fatal symptoms, especially considering that there was some knowledge of this disease that the characters didn’t. The story did a fairly good job of keeping the reader interested and curious throughout the book, with lots of bits of real-world information and also information from the fictitious world. Despite this, there were some glaring parts of the book that were disinteresting, mostly due to the dryness of some of the information. The real world information sections of the book and the flashbacks were very hard to read because there was so much going on in the present day, and didn’t really add much detail or vibrancy to the book--one entire chapter dedicated to the “history” set the stage for something that seemed like an obvious development in the book, yet was never mentioned again. I would recommend this book to people who enjoy a specifically medical (pathological especially) mystery novel. I think that the author of this book was really trying to recreate a Michael Crichton-style novel, full of relevant, well written information, yet left readers who were expecting that (such as me) disappointed. I would definitely not recommend this book to people who do not like gore, because this book is incredibly gory and quite disgusting in some parts. I also think that there were also some glaring flaws in the writing: there was some considerable disorganization in some of the ideas, and was not the most well written book that I have read. Woah. This book is scary. I give it four stars rather than five just because I found that the nonfiction information was put into the book in a bit of a disconnected way. But the information was still fascinating and terrifying. The fictional story kept you on the edge of your seat too. What a ride. I think I need to take a break from Preston's work so I don't get too paranoid, but I love it too, so we will see. Fiction. Written very much in the style of Preston's The Hot Zone: A Terrifying True Story, except this is fiction and some of the things that worked well for Hot Zone didn't quite work here. The Cobra Event tells the story of a genetically engineered biological weapon and the government task force put together to stop it. There's a lot of detail. Most of it blends right in, but there are times when information is just dumped into the narrative instead of gently stirred in, and at least one of t Fiction. Written very much in the style of Preston's The Hot Zone: A Terrifying True Story, except this is fiction and some of the things that worked well for Hot Zone didn't quite work here. The Cobra Event tells the story of a genetically engineered biological weapon and the government task force put together to stop it. There's a lot of detail. Most of it blends right in, but there are times when information is just dumped into the narrative instead of gently stirred in, and at least one of the characters seemed to be an expert in EVERYTHING. It works as a thriller. It's exciting, gross, and if it occasionally stretched my disbelief, at least it kept me reading. The pacing is a little uneven and as the focus zooms in and out on different plots it would sometimes neglect to return to something I thought was important. As a cautionary tale against biological weapons...I don't know. It's impossible to tell just from reading the book which parts are true and which are made up to serve the story. I wish Preston had just written a non-fiction piece on the subject, though maybe there aren't enough verifiable accounts to do so. Let's talk about ladies now. Preston's characters are a diverse bunch. There are a lot of characters of color and women (and women of color) in the task force and, for the most part, the women are professional and competent, just like the men, but, let's be honest, Preston just cannot write the ladies. These characters would be doing their jobs, you know, autopsying someone or whatnot, and suddenly they would have the most ridiculously gendered thought pop into their head. It felt forced and unnatural and as a consequence the first chapter of this book is just awful because it's about a seventeen-year-old girl who does not sound at all like a seventeen-year-old girl. And, unfortunately, it also suffers from CRAYZEE VILLAIN disorder. Twice over. By which I mean the villain's pov was overdone, as it usually is in thrillers, and he seemed to identify as schizophrenic. It's not hammered into the narrative, but it's there. Three stars. I liked the stuff about biological weapons. I liked the mystery component. I liked the suspense. The characters are not so hot, but the thriller part did its job. 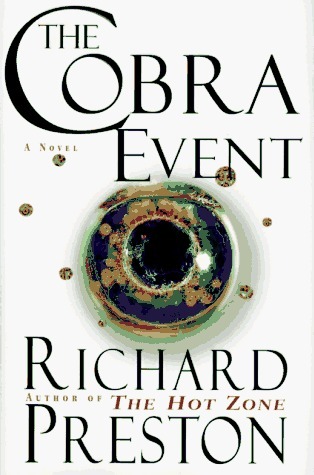 The book I choose to read was The Cobra Event by Richard Preston. It contained 404 total pages, and was published by Random House Inc. I was interested in reading this book due to my interest in forensic and medical sciences. And I had heard about his books before and wanted to try one out for myself. The main character in the novel is Dr. Alice Auster. She is the 29 year old pathologist trying to solve the mysterious cases sent her way. She is the person with is sent to help with the dead girl's The book I choose to read was The Cobra Event by Richard Preston. It contained 404 total pages, and was published by Random House Inc. I was interested in reading this book due to my interest in forensic and medical sciences. And I had heard about his books before and wanted to try one out for myself. The main character in the novel is Dr. Alice Auster. She is the 29 year old pathologist trying to solve the mysterious cases sent her way. She is the person with is sent to help with the dead girl's case. Who we later find out is Kate Moran. She was the young girl who died at her school, at the time for unknown reasons. She was found having seizures and biting her own tongue off. Kate is Auster’s first real lead in her investigation. Kate is the reason she was interested in the first place,We then meet Harmonica Man the homeless man.. He died suddenly on the New York subway platform with the same symptoms as Kate. The most infamous character of them all is Archimedes, the evil mastermind behind the creation of the virus. We then meet the minor character, Dr. Dudley the Chief Medical Examiner. We see a tug of war between him and Dr. Alice Auster. He frequently undermines her work throughout the story. This thriller is based mostly in New York city in the present day but the novel also jumps to scenes in Washington DC and the Pacific Ocean. Throughout the story Austen tries to find the cause of the deaths she is investigating. She takes the case into her own hands and tries to investigate. Every clue leads her closer to what this virus is. When she finds the source of this violent outbreak she forms a team called Reachdeep to help stop it from killing anymore people. They search to find the culprit of these heinous actions.The team ends up finding and stopping Archimedes. They stop the virus from effecting anyone else but it could not be totally erased. The virus still lives on in the rat population in New York City. Richard Preston is best known for his nonfiction book The Hot Zone, a horrifying account of the Ebola virus, and other research based books. I was interested in reading his fiction book The Cobra Event. It is a chilling story about what a bioterrorist attack could look like today. Preston also has included in the story some of the history of bioweapons and information regarding bioengineering. If you want to be scared to death by a fiction book that is solidly grounded in fact and almost reads l Richard Preston is best known for his nonfiction book The Hot Zone, a horrifying account of the Ebola virus, and other research based books. I was interested in reading his fiction book The Cobra Event. It is a chilling story about what a bioterrorist attack could look like today. Preston also has included in the story some of the history of bioweapons and information regarding bioengineering. If you want to be scared to death by a fiction book that is solidly grounded in fact and almost reads like nonfiction, The Cobra Event will fit that description. The bioweapon used in Preston's The Cobra Event, is a genetically engineered viral brain pox being slowly "tested" on humans by one crazed man. After 2 suspicious deaths in NYC, the CDC sends Dr. Alice Austen to do the autopsy of a 17 year old girl who dies from this virus. The FBI is also called in and the search for what the virus is and who engineered it begins. There are several very vivid descriptions of autopsies and of the symptoms and ultimately the violent behavior the virus causes in humans (seizures, self cannibalism). This is a very gripping story because it is so based on real facts. Ultimately, Richard Preston is a nonfiction writer and he writes like one. This isn't always bad, but it does mean that, for example, when describing his characters, he gives us just the facts. Do not expect lengthy descriptive passages that help develop well rounded characters. He gives us the basic information and then proceeds onto his fictionalized attack and real facts regarding bioweapons. His facts are gripping and the story certainly moves along, but The Cobra Event often reads like an nonfiction account of an event.